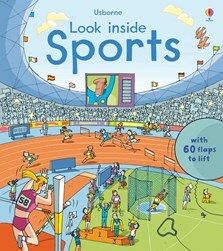 A fun flap book that shows young children what goes on at major sporting events and introduces them to a range of different sports. Scenes include a professional swimming pool, an athletics stadium, a ski slope, and a cycling velodrome. With over 60 flaps to lift, there’s lots to discover on each brightly coloured page and plenty to keep enquiring minds occupied, including flaps hidden beneath flaps.